Every now and then, there’s lots of excitement about a new product line in the pen community. 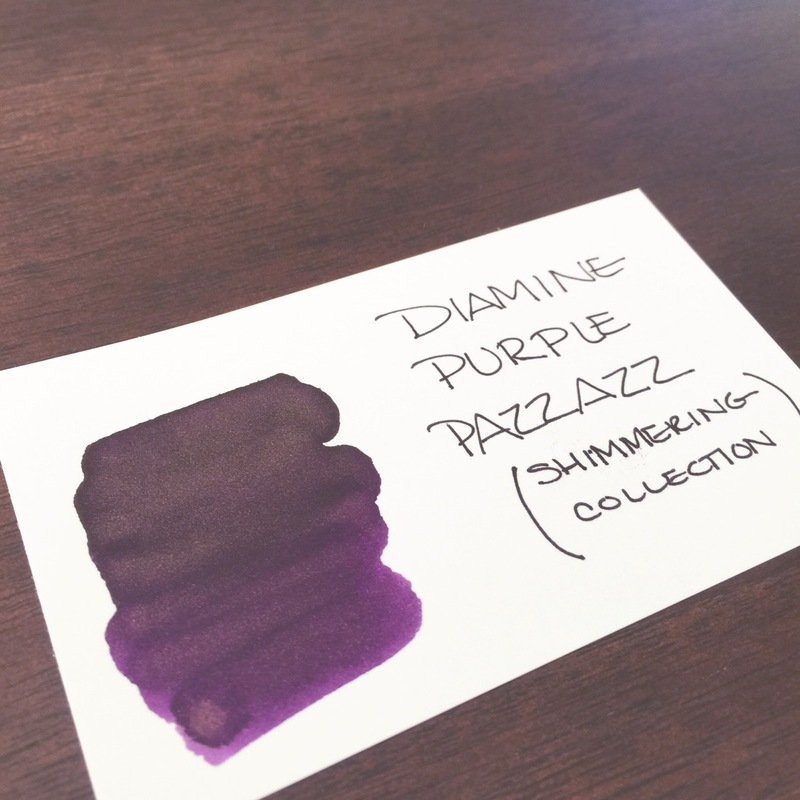 Diamine Shimmering Inks definitely caused a lot of speculation and conversation. 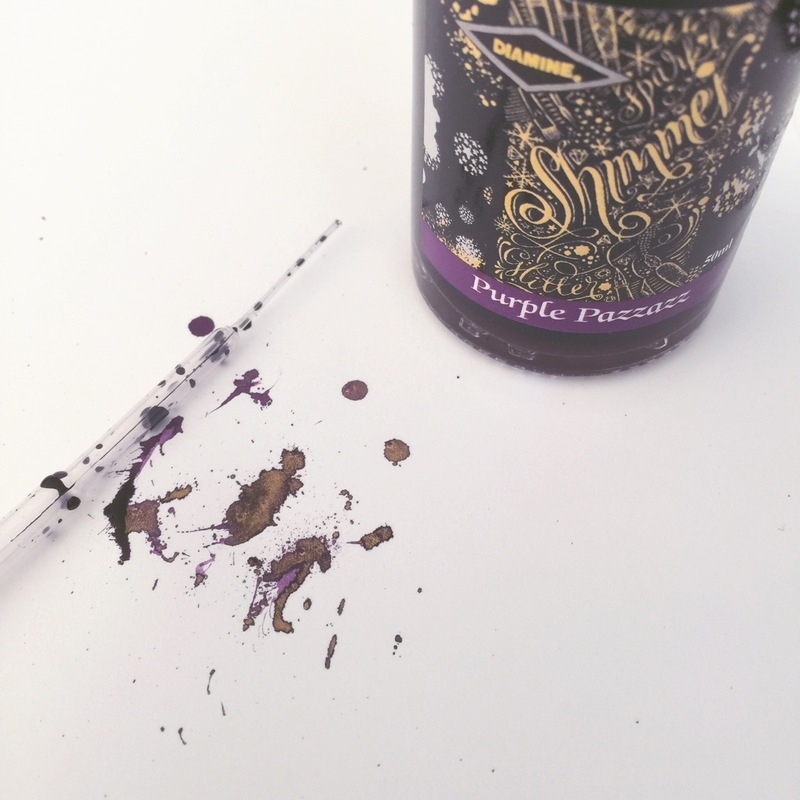 After gently shaking the bottle, I swabbed Purple Pazzazz (the spelling kills me!) on both a smooth card and a textured Mnemosyne Word Card. I love the Purple Pazzazz’s color. 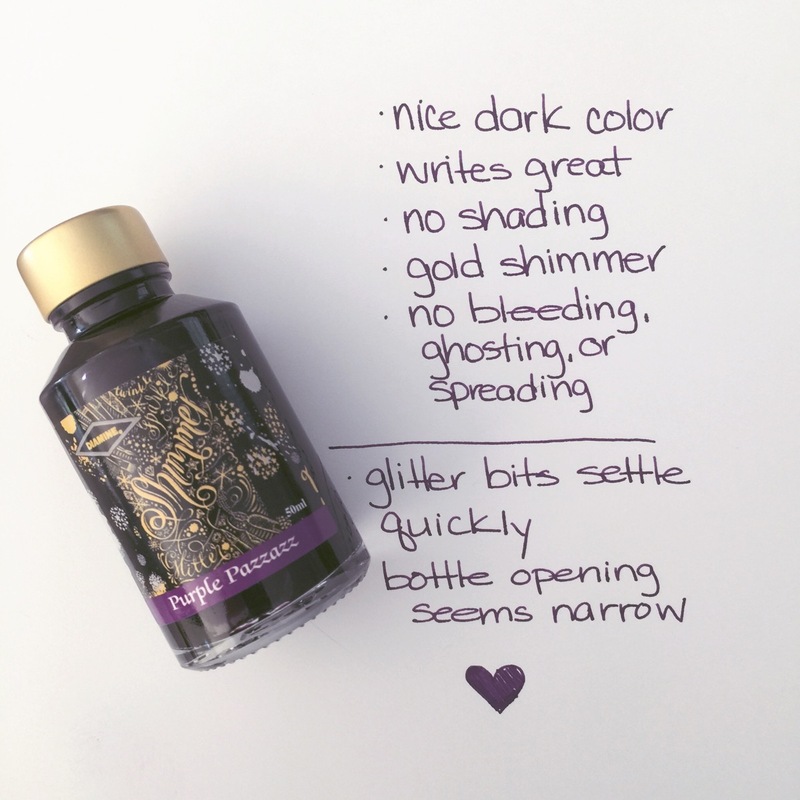 A nice deep, rich purple and and the gold shimmer is present, but not overwhelming. I like using Lamy Safari / Al-Star for new-to-me inks. The Safari pens perform consistently for me and nearly all inks work well in them. I selected a broad nib to encourage lots of shimmery goodness. I’m bummed that the gold shimmer isn’t noticeable in my writing samples. I definitely gave the bottle a good shake before filling. Maybe it’s the paper (HP 32lb.) I’m using? 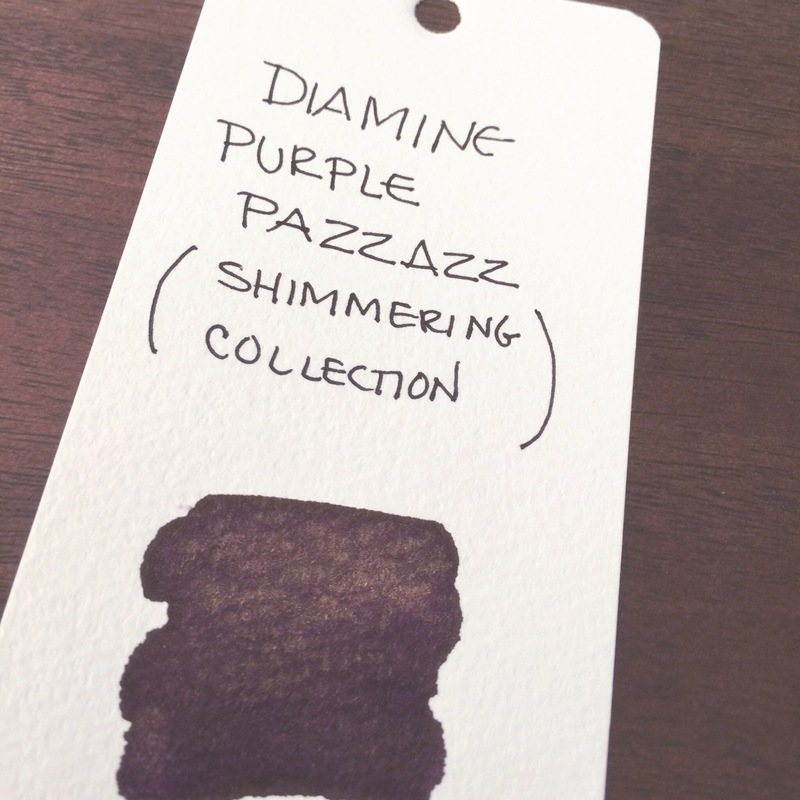 Gold bits aside, Purple Pazzazz (that spelling!) is a wonderful ink. The color is a dark dark eggplanty purple. It performs well with no issues whatsoever. Diamine is so smart. 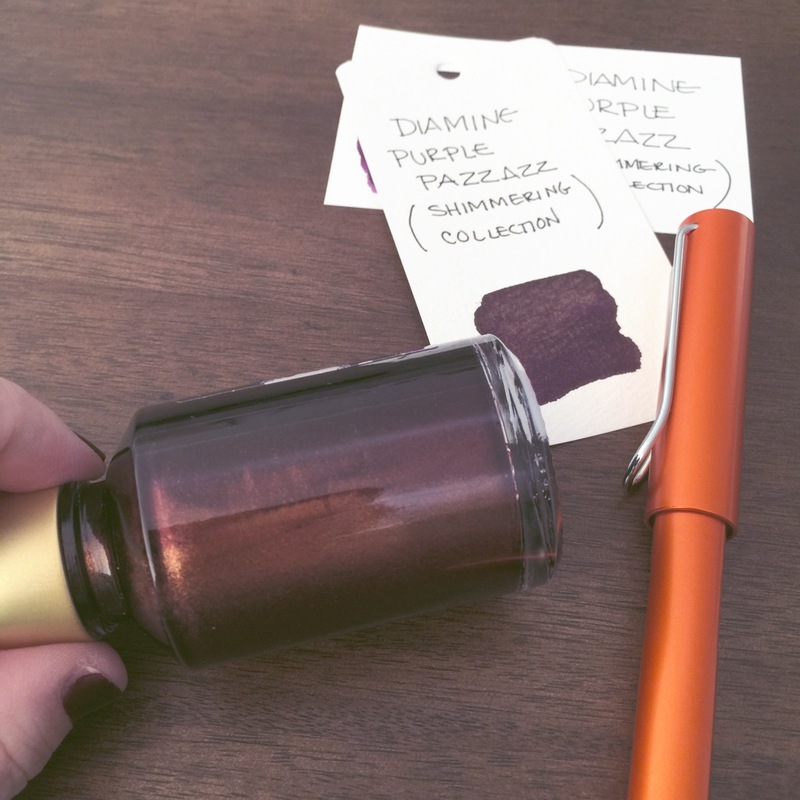 The color of the lid on each of their Shimming Inks is the color of the shimmer – gold or silver. The opening of the bottle seems a little narrow to me, but the Safari was able to be dunked in there with no trouble at all. Making spatters is a guilty pleasure. Lovely gold shimmy-shimmy in the spatters. I’m going to need to give Purple Pazzazz another try. 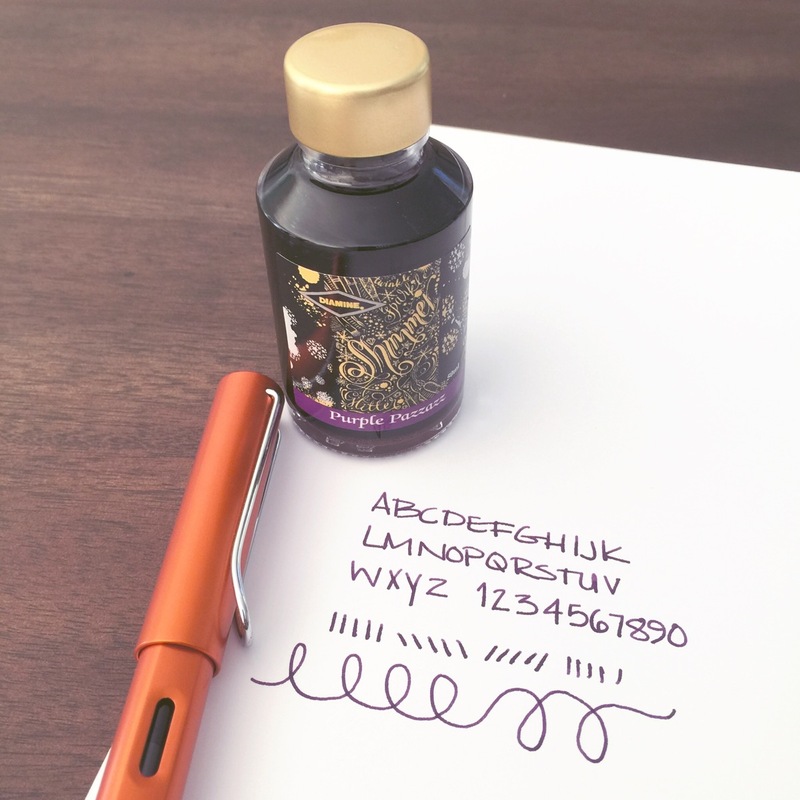 I really want to see that golden sheen in handwriting. 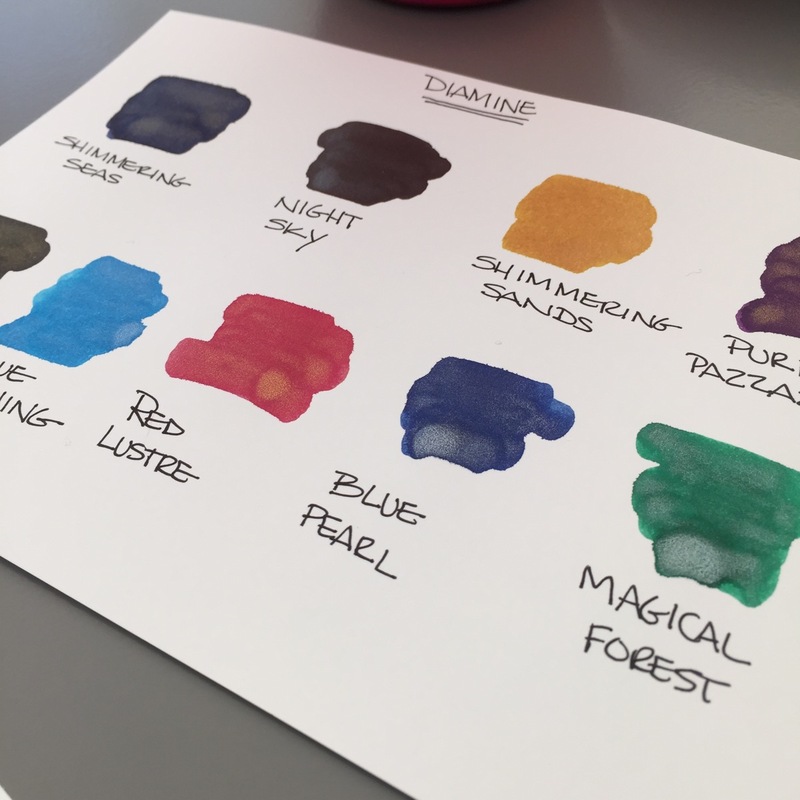 I mentioned above that the Diamine Shimmering Inks comes in ten different colors – below are swabs of the nine I have. I missed Brandy Dazzle, darn it. Fortunately, Pen Chalet included a coupon in my box for 10% off my next order and I’m about to take advantage of that. Keep an eye on my Instagram feed and here as I try out more from this line and please let me know your writing experiences with them, too! 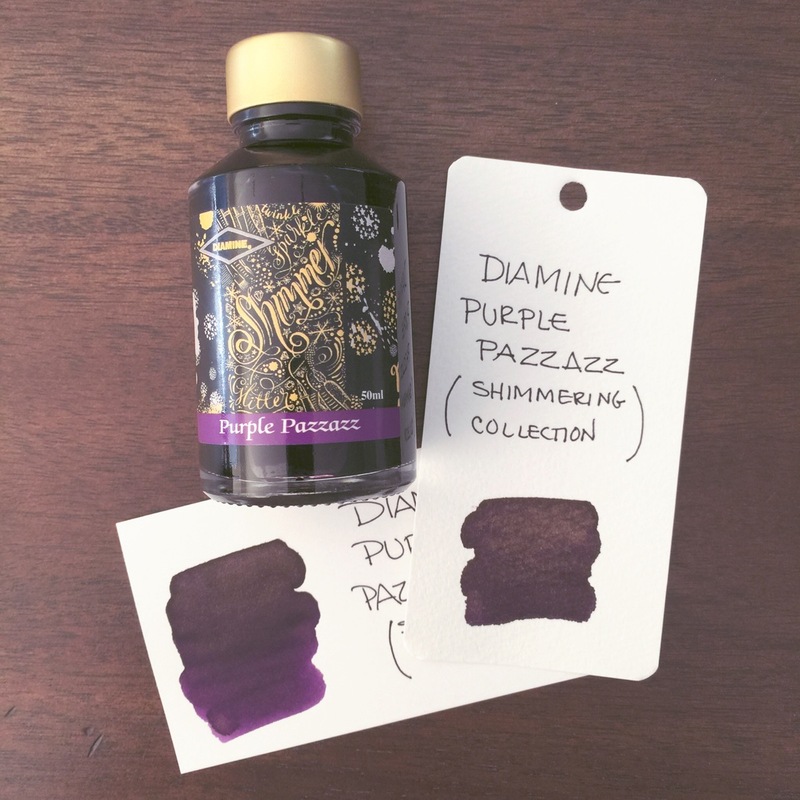 This entry was posted in INKS and tagged diamine, ink review, pen chalet, purple, sponsored by Christine (Pentulant). Bookmark the permalink. I’m so happy I found your review. 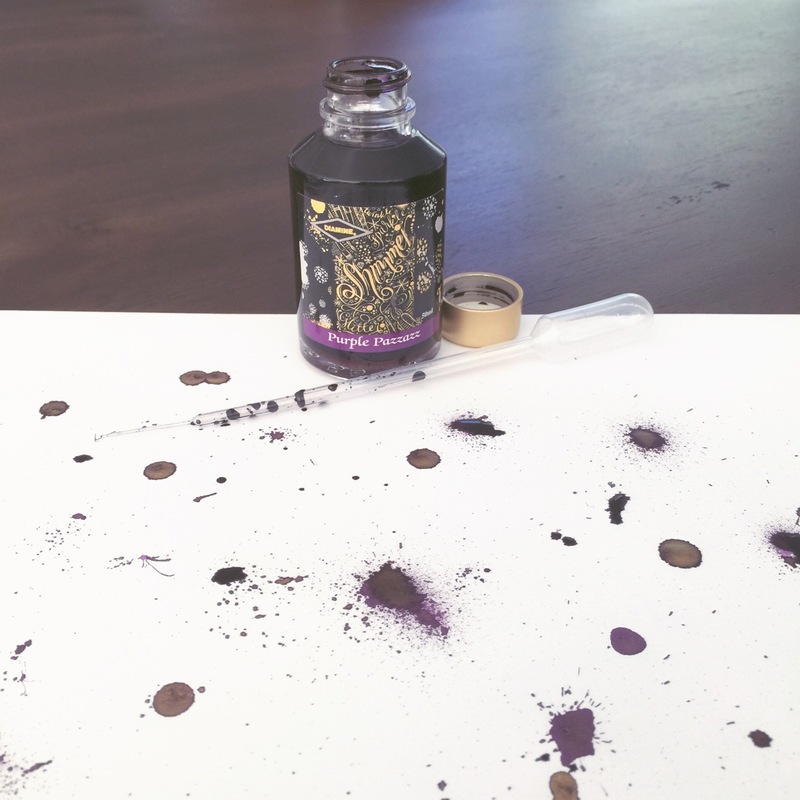 I’ve been eyeing these inks and wondering how they looked outside the bottle. Thanks so much for the great info as I’m new to FP’s and inking them also. So excited to now try these.